Posted on October 10, 2012 by Susan H.
I love Fall’s abundance of the many varieties of squash and apples, the crisp fresh weather, the layering of comfy clothing, snuggling up in blankets, the roar of a gas fireplace (on my wish list as we don’t build real fires in the house due to our asthma), and hearty, ‘stick to your ribs’ soups. 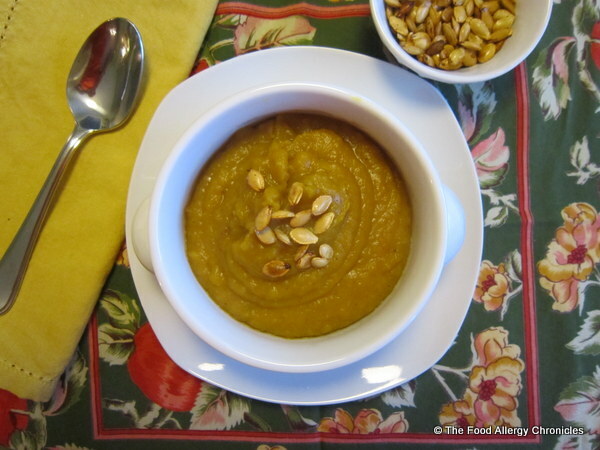 I have heard it said, “What grows together generally pairs well together”…therefore, I thought I would pair squash and apples in a soup for a heart warming fall supper. I referred to a recipe I had tried last year from the Ina Garten Barefoot Contessa Parties! Cookbook. Click here for the original recipe. 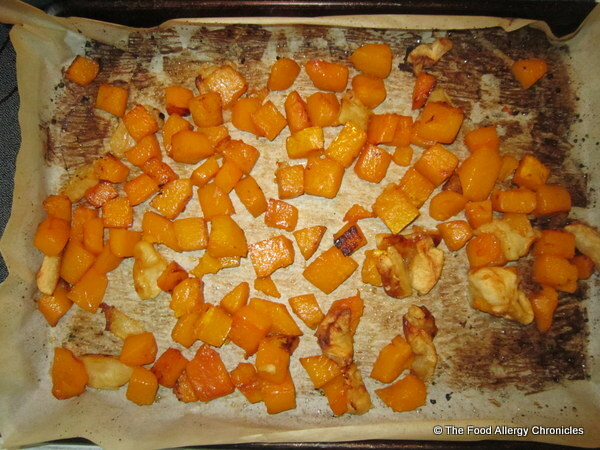 I adapted her recipe by roasting the squash and apples tossed in olive oil, pure maple syrup and a crackling of sea salt. I think roasting brings out the best flavours in veggies. I omitted the butter, used a couple of Spartan apples, added in some extra spices and made sure to use pure apple cider. The final result…just what I was craving…it was amazing! Even my husband, who was not so keen on the soup last year, enjoyed a bowl. Michael dipped in with some crackers and deemed it, “Not bad.” and Matthew, well, he steered clear of it…orange veggies never did appeal to him. 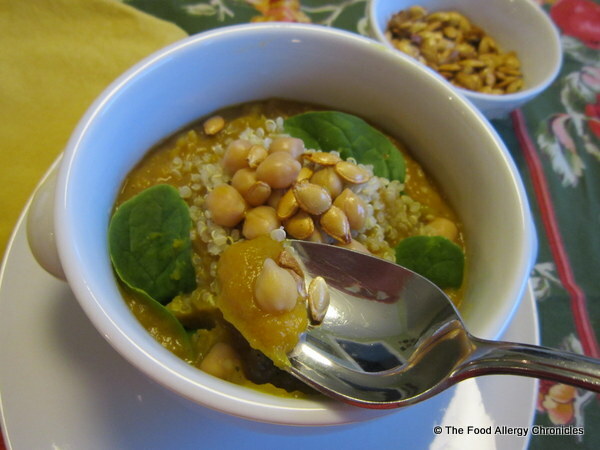 …or jazz it up with baby spinach leaves, quinoa, and chickpeas. The possibilities are endless…have fun switching up the flavour combinations! Peel and slice spartan apples. Toss butternut squash and apples with olive oil and maple syrup. Spread on a parchment lined baking sheet. Roast at 450F, tossing every 10 min for 50-60 minutes or until tender and browned. In a large pot, saute the onion and spices in a tablespoon of olive oil until softened. Stir in roasted squash and apples. Add water, apple cider and salt and pepper. Bring to a boil and let simmer for 15 minutes. Tip 1: Save the seeds for roasting…rinse and dry on paper towel lined plate. Toss with olive oil, salt and pepper and roast on parchment lined baking sheet at 350 minutes tossing occasionally until browned. 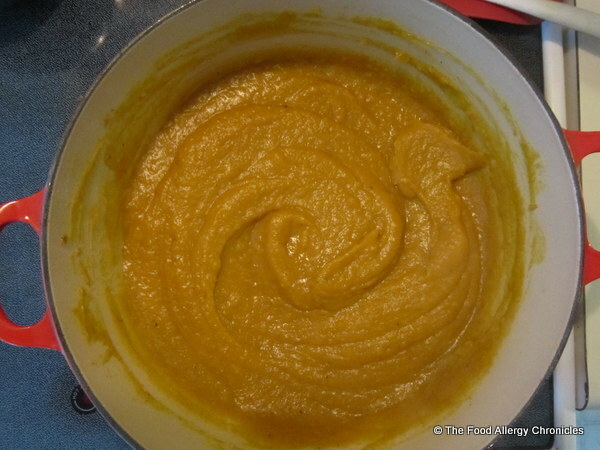 Tip 2: I love to freeze any leftover soup in batches for easy go-to meals in a pinch. 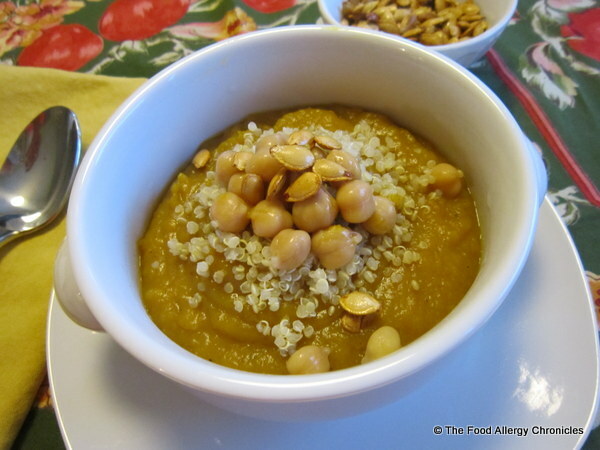 This entry was posted in dairy free, dinner, lunch, multiple food allergies, mustard free, peanut/tree nut free, sesame free, side dish, soups, soy free, vegetables and tagged Barefoot Contessa Parties Cookbook, Dairy Free Maple Roasted Butternut Squash and Apple Soup, dairy free soup by Susan H.. Bookmark the permalink. 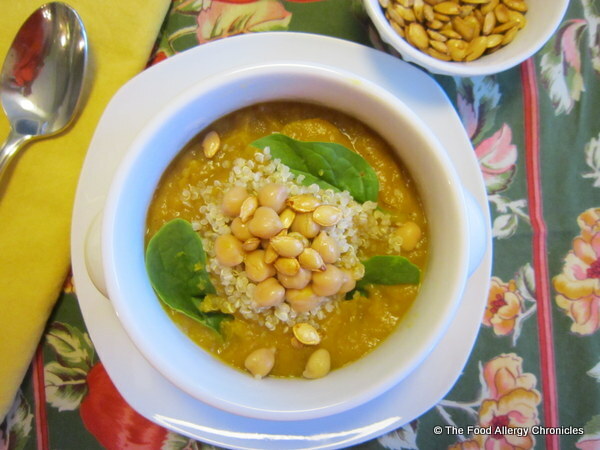 Love this recipe – so fall-perfect! How have you been?